Tens of thousands of migrant workers are leaving the southern Chinese city of Guangzhou after losing their jobs, railway officials say. The increase to 130,000 passengers leaving the city's main station daily is being blamed on the credit crunch. Guangzhou is one of China's largest manufacturing hubs, but many companies who export products have collapsed. 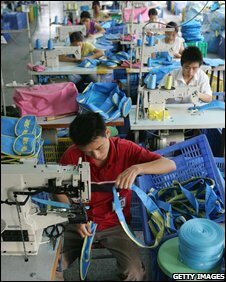 Chinese officials are worried that a sudden increase in unemployment could lead to social unrest. The most badly hit export companies are toy, shoe, and furniture manufacturers. There are already reports of demonstrations and social unrest in the provinces of Zhejiang and Guangdong. An upsurge of labour disputes caused by bankruptcies and layoffs this week forced the boom-town of Shenzhen to issue an urgent notice calling for government departments and enterprises to work together to reduce tension. BBC China analyst Shirong Chen says there would be a ripple effect in many inner regions of China too - the earthquake-hit Sichuan Province has 1.3m working in Shenzhen. For the Chongqing municipality, three million migrant workers used to send home millions of US dollars' worth of local currency every year, but this source of funding is dwindling to a trickle.